Remember Palm? Yeah, that Palm - the one who made the original Palm Pilot. Yeah, they are finally back! Live from CES! Today Palm announced their newest pda, the Palm Pre. 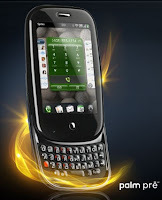 The have created a new webOS mobile platform, designed to be constantly connected to the web. Their buzz word is "Synergy" - isn't that a little 1999? Anyway "Palm Synergy" is supposed to keep your calendars continuously synched, your contacts linked and conversations seamlessly carried between messaging platforms (start on MSN, they say, and easily switch to text within the same UI). For now, it's a bunch of smoke and GIFs, but we should see something in the first half of 2009. And it seems to be in partnership with Sprint so I wonder how long before it hits Canada. The Palm website (www.palm.com) doesn't actually contain much info. For pics and bit of info, go to Sprint's Pre microsite (www.sprint.com/palmpre).